Vitiligo can be an emotionally devastating condition as it can drastically alter your appearance. In this condition, patches of skin lose melanin, the pigment that controls the color of the skin, hair and eyes. Recent awareness of the condition was spurred by the late pop singer Michael Jackson, who blamed vitiligo for his lightened skin. Many doubt that he actually had this condition, but rather he was whitening his skin all along. As the melanin disappears, the affected area of skin turns white. In individuals with dark skin, this can be particularly troubling, especially if it occurs in areas that are highly visible, like the face, neck, arms and hands. The condition can occur in people of any race or skin type and at any age, though it most often initially presents between the ages of 10 and 30. Pigment loss is the primary symptom, though in some cases it may also be accompanied by premature graying of the hair, loss of color in the tissues lining the mouth or loss of color in the retina, or inner layer of the eye. The spread of the condition can follow one of three patterns: Generalized, where loss of pigment covers a wide area of the skin, usually symmetrically on both sides of the body; Segmental, where loss of color happens only on one side of the body; and Focal, where loss of pigment is focused on particular areas of the body. The skin is made up of two main types of cells or building blocks: keratinocytes and melanocytes. The keratinocytes make up the bulk of the skin. The melanocytes are the cells that make the skin color. In people with vitiligo, the immune cells (cells which fight infection) attack the melanocytes and kill them. When the melanocytes in a certain area die the skin turns white. No one knows why the immune cells attack the melanocytes in people with vitiligo. Patients with vitiligo are sensitive to free radicals and need aggressive vitamin therapy (see below). Vitiligo sometimes runs in families, meaning that a genetic/hereditary factor may be involved. It sometimes occurs at the site of an old injury. It is not contagious as some believe. Is there an effective vitiligo treatment that works? Most people have slow progression of their disease. In some people the problem will disappear by itself. As far as vitiligo treatment, patients should take a B-complex multivitamin each day. Also take Folic Acid 1 mg, Vitamin E 600 – 800 IU, and ascorbic acid 1000 mg a day. All of these nutrients can be found in a specialty supplement such as Total Balance. Vitamin D ointment by prescription can help some people with vitiligo, as can Tacrolimus ointment .1% for a period of 6 months. This medication also requires a prescription. Topical cortisone ointments by prescription can treat many cases of vitiligo. Cover-up cosmetics such as Dermablend, Chromelin Complexion Blender and Covermark work well. PUVA light treatment has a high success rate, although this treatment is very time-consuming. The patient must come to the dermatologist’s office 2-4 times per week for 15-30 minutes to stand in a light box for 100-300 treatments. The treatment often takes a year or more and does not work for every patient that tries it; 50-70% of patients treated get a good response. Narrowband UVB is safer than PUVA and works just as well for the treatment of vitiligo. 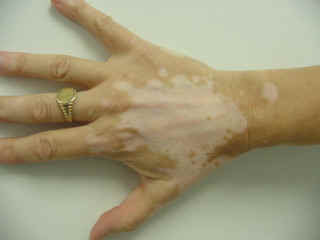 Severe case of vitiligo that do not respond to treatment can be treated with Benoquin by prescription. This medication causes permanent whitening of the dark areas of the skin and should only be used as a last resort.